Conflicts in Ukraine, the Middle East and Asia saw China, Russia and Saudi Arabia increase their defense spending the most in 2014, while top buyer the US cut it by 6.5 percent, the Stockholm International Peace Research Institute (SIPRI) has reported. Globally, military spending remained almost unchanged in 2014 at $1.8 trillion, falling by 0.4 percent in real terms since 2013, according to figures released by SIPRI on Monday. 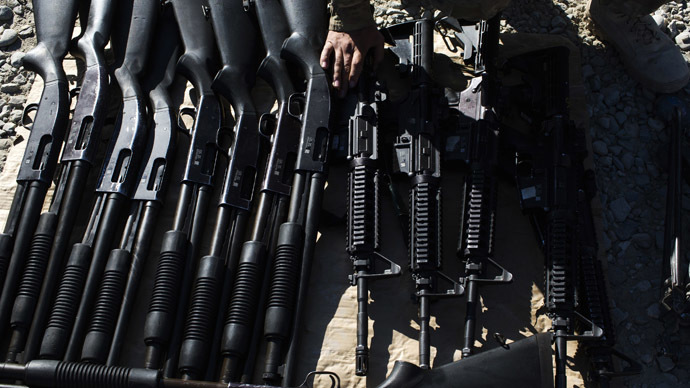 Although the United States has cut back its military spending by 6.5 percent last year to $610 billion as part of a broader measure to reduce the country’s budget deficit, it still remains the world’s largest purchaser of arms. Spending has fallen by 20 percent since its peak in 2010; however, it is still 45 percent higher than in 2001. Saudi Arabia had the biggest percentage increase among the top 15 spenders worldwide, rising 17 percent to $80.8 billion. The huge increase in Saudi Arabia’s budget is a reflection both of the continuing conflict and instability in the surrounding region. China’s military spending has generally kept pace with its economic growth rate, rising by 9.7 percent from a year earlier to $216 billion. Russia’s military expenditure increased 8.1 percent to $84.5 billion. The Ukraine conflict made many countries close to Russia, particularly in Central Europe, the Baltics and Scandinavia, increase defense budgets, the report says. At the same time, five major spenders in Western Europe - France, Britain, Germany, Italy and Spain - have all budgeted for further, small cuts in 2015. Ukraine increased spending by over 20 percent in 2014 and plans to more than double expenditure on the armed forces in 2015, SIPRI said. “The Ukraine crisis has fundamentally altered the security situation in Europe, but so far the impact on military spending is mostly apparent in countries bordering Russia. Elsewhere, austerity remains the main driver of downward spending trends,” Dr Perlo-Freeman said. Russia is also budgeting for increased spending in 2015, but this was planned before the Ukraine conflict. A substantial increase of around 15 percent in real terms to $66 billion is budgeted in 2015, with almost most of the extra “earmarked for procurement, which is set to increase by over 60 percent in 2015 and to remain at this higher level in 2016 and 2017,”according to the Stockholm Institute report. The original Russian military budget for 2015 has been reduced by 5 percent following falling oil prices and Western economic sanctions that led to the Russian ruble devaluation.